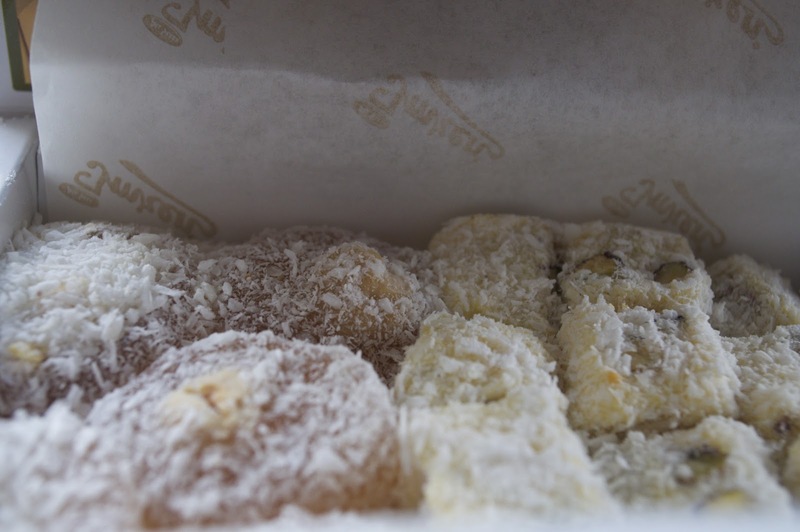 Following on from our recent post about baklava, the other sweetie we obsessed over during our trip to Turkey was lokum, or Turkish delight. A and C really enjoyed proper Turkish delight, which is a far cry from the abomination that is Fry's. Turkish delight was invented in the eighteenth century, when Bakir Effendi moved from his home town of Kastamonu in north-central Anotolia to Istanbul to open up a sweet shop in 1776. 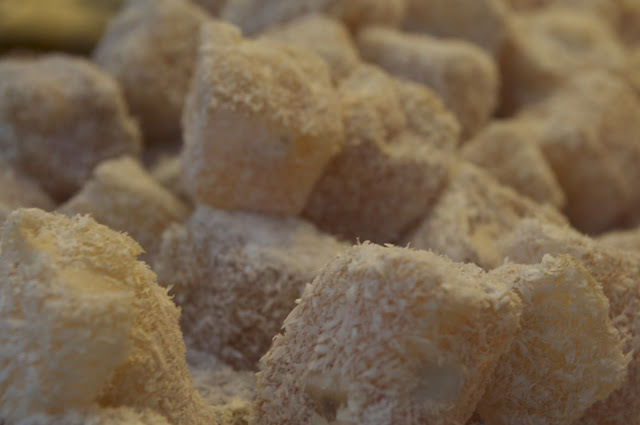 The lokum itself is cubes or blobs of gel made of sugar and starch, and then flavoured and dusted with dessicated coconut or icing sugar. The possibilities for flavouring are almost endless, but more traditional flavours include rose, mastic and pistachio. 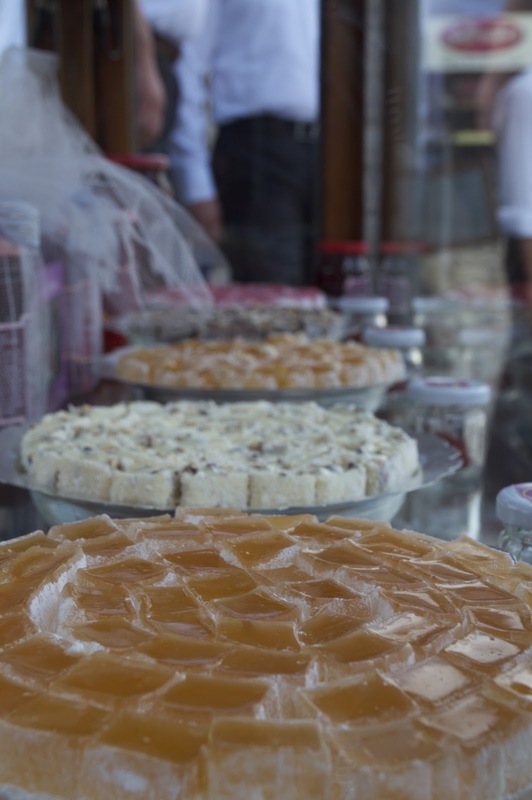 We happened to travel through both Kastamonu and Istanbul during our recent trip and discovered that the area around Kastamonu, in particular, is steeped in culinary tradition. The area appears to keep the spirit of Bakir Efendi alive: Safranbolu is a little town within spitting distance of Kastamonu and is famous for its lokum and for the production of saffron (for more information on the food and drink of the area around Kastamonu, see our post on Safranbolu and Turkish breakfasts). 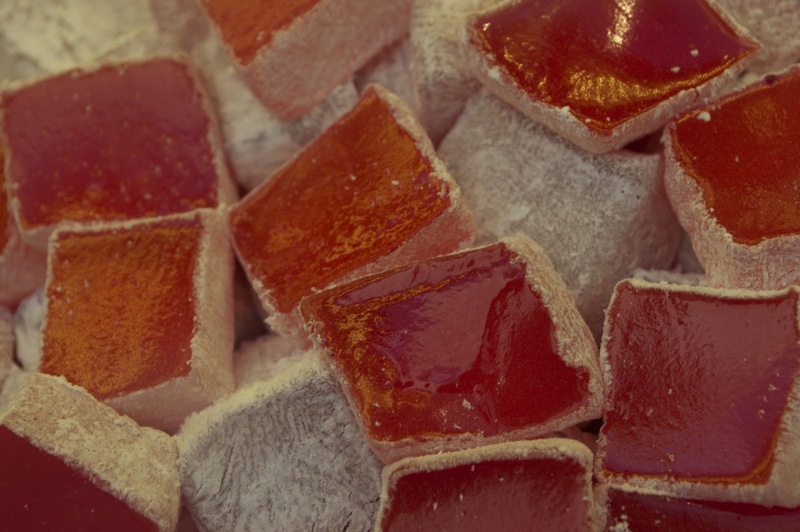 While we nibbled Turkish delight in various places around Turkey, we found that the best Turkish delight appeared to come from either Istanbul or the Kastamonu area (given the history of the foodstuff, this is no surprise). Safranbolu was full of little shops selling lokum, and Istanbul has a number of big-name shops selling it, popular Istanbul lokum outlets include Koska and Karakoy Gulluoglu, both of which have shops all over the city. 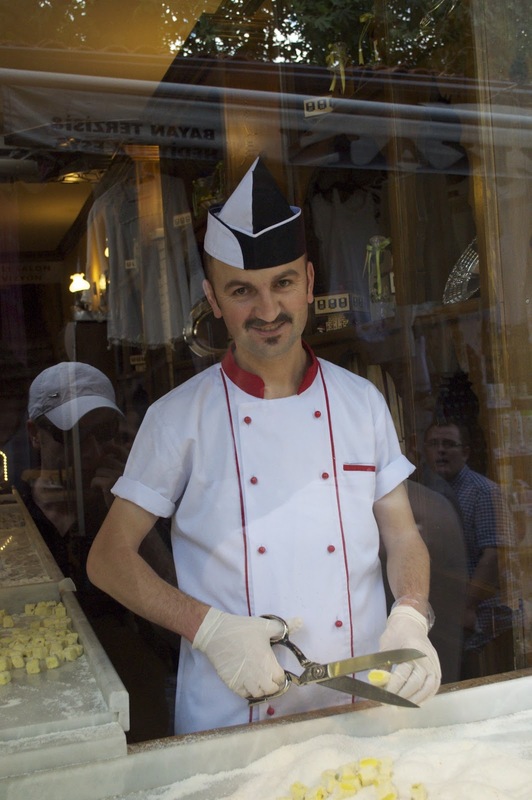 In addition, arguably the world's most famous lokum shop is in Istanbul: the Divan Hotel is renowned for its Turkish delight. C really took to the apricot flavour and wolfed down more or less the entire allocation of the pieces we picked up in Safranbolu; this left A to sample the saffron offerings for which Safranbolu is famous. A was initially skeptical, but he was won over: the lokum purchased was a remarkably delicate balance of the spice, pistachio and coconut, which had a real depth and complexity of flavour. We also found that Koska's and Karakoy Gulluoglu's were more than up to scratch. Karakoy Gulluoglu does a particularly tasty rose water offering and even their mastic lokum is good. Mastic gum has a flavour all of its own which A generally cannot stand, but Karakoy Gulluoglu do a remarkably good job of turning this disgusting plant extract into something really yummy. We found that Koska's offerings are absolutely packed with flavour and their popularity in Istanbul is well deserved. The intensity of flavour, however, can be a little bizarre at times; for example, Koska's mint lokum is distinctly similar in flavour to mouthwash and Canadian root beer. There are a number of places in London where you can get real lokum. Many nice Ocakbasi restaurants will present you with a couple of pieces after your meal (Baran in certainly does: if you are ever in NW11, this place is well worth a look!) and many of the Turkish delis in Stoke Newington sell lokum as well. Also, if you're ever feeling flush you can always go to Harrods and pick up the Divan Hotel's famous lokum (for a price). The history of food has always been one that fascinates me. 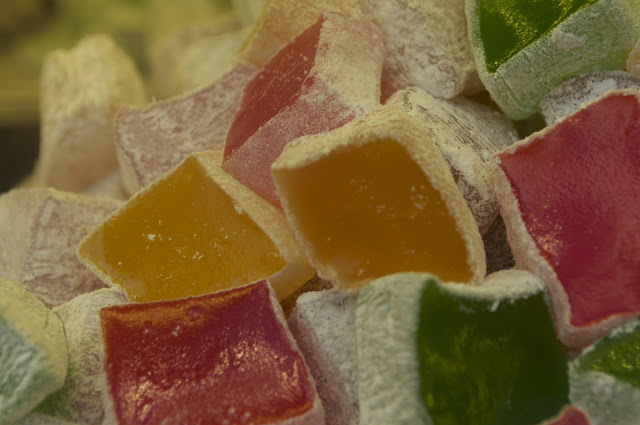 As a child I would always nom away at Turkish delight, thinking that in some way they had been the product of a turkey (the bird) - perhaps droppings, or innards; my child brain went wild. 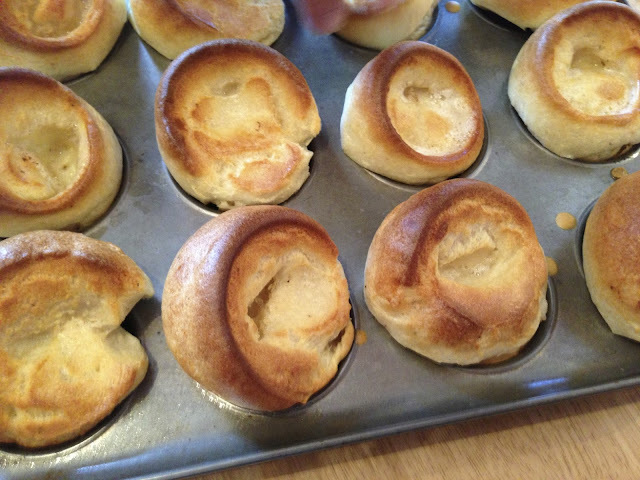 But its true meaning is far more poetic - lokum apparently means morsel, or mouthful which is why originally they were called lumps of delight. Who do we think are to blame? Turkish translators, English translators, or is it just a product of language cleaning itself up?